The Best Dog Ramps Reviewed – Helping You To Make The Right Choice. . . From beds to stairs, boats to pools, and even cars or SUVs. We’ve picked out the very best dog ramp options. When you need support while walking or climbing, you hold on to the railing or use crutches or a cane. When your dog needs support for these same activities, what does she use – a dog ramp, of course! For you as her owner, it sure feels good to be able to quickly identify what your fur baby needs help with. And to know exactly what type of support to offer her! Whether your purpose for researching ramps for dogs is to provide your canine other half with a dog car ramp for easy entry and exit, a dog bed ramp to make morning and evening snuggles easier or for another reason entirely, we aim to help you quickly identify the perfect outdoor or indoor dog ramp to meet your pup’s needs and your budget. Now read on to learn about some of our favorite indoor and outdoor dog ramp options so you can choose your own favorite dog ramp for your pooch! A dog ramp can be many things depending on your dog’s unique needs. For example, if your dog is recuperating from an injury, a car ramp for dogs can minimize joint stress when getting in and out of the car. And a pool ramp for dogs can make rehabilitation with hydrotherapy much safer. Also, if you are caring for a senior dog, use of a dog ramp can ease aches and pains and reduce the chances of preventable injury when your dog is moving around in the house and entering/exiting the car. Also, If your pup is of a breed known to have genetic-based joint issues (such as hip dysplasia), a large or small dog ramp can be a must-have accessory throughout life. You may actually be able to prevent genetic-based injuries just by taking stress off your dog’s body through using a dog ramp starting early in life! So now let’s look at some great dog ramp options we hope you and your pooch will love! Who doesn’t love cuddling at bedtime “with pup?” But when your dog struggles to get up or down from your bed, the frustration can cause anxiety and stress for you both. Here’s hoping one of these neat dog ramp for bed systems can come to your rescue! This truly innovative L-shaped wrap-around dog ramp for high bed makes use of two front-facing and two side-facing stairs to fit compactly into any bedroom. The bottom has rubber grips for stability. It is best used for small and medium pets up to 75 pounds. The back panel is hinged for access to a secret storage space. The color is brown and tan. Buy your Easy Step Bed Stair here. This beautiful set of pine and mahogany wood stairs can blend in well with any décor. It is a great choice for bedrooms and living rooms. You can choose from a two-step and three-step configuration. Each folds up for storage. The steps are carpeted with non-slip, easy to clean fabric. These steps can support dogs up to 130 pounds, which makes it suitable for larger Labs too. Buy your Pine Dog Ramp Steps here. These beautiful dark wood dog stairs have a rich espresso finish that can complement the most elegant interior décor. The steps are lined with a classy black no-slip fabric and the sides are raised for safety. There are four steps total. When you need to store these stairs, they fold down and have a built-in carry handle to make this easy. Sometimes it may be easier for your dog to use a ramp instead of traditional step stairs. These great dog ramps can be used indoors or outdoors, with cars, pools, therapy sessions, decks and vehicles. This dog ramp for outdoor stairs ensures your dog can get in and out with a minimum of effort and energy. The telescoping design makes it compact for travel and features one-hand operation. The ramp itself weighs in at under 12 pounds but will support dogs up to 220 pounds. It has a non-skid surface and can be paired with a scratch guard if desired (sold separately). Buy your Easy Steps for Dogs here. This easy to use outside dog ramp can serve as stairs up and down from cars, SUVs and trucks as well as raised outdoor areas like decks. It comes in three sizes: 6 feet by 15 inches, 7 feet by 15 inches or 8 feet by 15 inches. The surface is non-slip high-traction tape and the frame is aluminum. It will support dogs up to 250 pounds in weight. Buy your Aluminium Folding Pet Ramp here. This unique and unusual set of dog ramp stairs is designed for either entry/exit from high vehicles or to/from grooming tables and bath areas. It is guaranteed rust-resistant and made of chrome and steel. The overall height is 30 inches and the stair width (four stairs total) is 18.5 inches. The stair surface is covered with no-slip PVC rubber and it will support dogs up to 150 pounds. Perhaps your dog didn’t have any trouble jumping up and down from your vehicle when he was young and spry. But now, a little assistance will be eagerly appreciated so your pup can continue to enjoy short car trips and even longer road trips with you! This Solvit dog ramp is one of many highly rated and popular dog ramps the company designs and manufactures. But this is perhaps the closest to a “one size fits all needs” dog ramp due to the telescoping feature. Whether you have a teensy sedan, a medium-sized SUV or a giant truck, this dog ramp can get your dog from ground level to comfy passenger. The extension range is from 39 to 72 inches and it can support up to 400 pounds. Buy your Telescoping Dog Ramp here. Instead of telescoping, this dog ramps for cars and suvs folds up into three sections when not in use. The extra wide ramp is carpeted and reflective, which includes side-placed reflectors for dogs with poor vision and nighttime use. The ramp extends out to 71 inches and comes with a built-in carry handle. You can buy your Tri-Fold Extra Wide Ramp here. 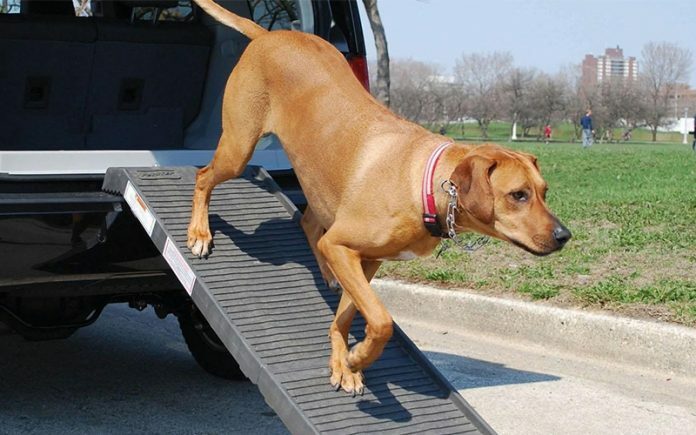 These easy-to-use, sturdy ramps for dogs to get into cars folds out to 70 inches. It features a non-slip surface with a 500-pound weight limit. There are two colors: khaki/beige and graphite/grey. This ramp folds in half for storage and has a built-in carry handle. It is rust-resistant and easy to clean with just soap and water. Buy your Folding Pet Ramp here. If you and your dog enjoy being out on the water together, what you need is a boat-friendly dog ramp. This is a must both for canine safety as well as enjoyment. This dog dock ramp does not need access to your boat stairs/ramp to let your dog enter and exit the boat or the water. It is suitable even for deep water use and can accommodate large dogs (100+ pounds) safely according to dog owners. The design features a stable flat mat on top of two inflatable round side floats with a center mesh “seat” your dog can sit in to just enjoy the water. Buy your Dog on Water Ramp here. Every year, many pets and wild animals accidentally drown in pools. More and more people are now installing dog pool ramp systems to reduce the danger. These ramps are also great to help a senior dog or injured dog in and out of the pool. This innovative and popular ramp serves two purposes: it can help your dog ease into the pool by placing him right out over the buoyant water. But it can also be a lifesaver in the event your dog falls into the pool and you are not nearby to notice and help him out! This dog ramp for pool comes in two sizes: regular and large. The color is white. Buy your Super Skamper Ramp here. This unique dog on water ramp option also serves a dual purpose by providing any pets with a handy escape if they didn’t mean to enter the pool and offer an easy entry/exit after enjoying a planned swim. There are three steps. The lowest step is below the water level and the steps secure to the side of the pool. They are easy to remove for cleaning and storage. The material is UV-resistant, chlorine-resistant plastic. The color is white. Buy your Pup Steps Small here. If you have an above ground pool or large water feature that your dog has access to, this super secure and stable stair system is a safety must. The total height from base to top step is 27 inches. With handles, it reaches to 81 inches. The color is white and it will require some assembly. Buy your Above Ground Pool steps here. A folding dog ramp is an ideal choice when you are living in a smaller space or plan to take your dog traveling with you. These folding dog ramp options are all highly rated and popular. This attractive plastic ivory and black dog door ramp folds down easily for storage or transport. It weighs just over three pounds and is best used with small or teacup dog breeds. Pet owners say to be sure to use protectors if you place these steps on wood floors. Buy your Plastic Folding Pet Steps here. These highly rated foldable dog steps are made from durable plastic with fabric in an attractive tan color. There are low side rails for safety that feature cute paw prints. The manufacturer states that these steps will support dogs up to 120 pounds, but dog owners say they are best used for dogs 75 pounds and under. Buy your Foldable Pet Staircase here. These unique low-angle folding dog steps come in three designs: 3-step, 4-step and 5-step. This loader system is only designed for use with rear-loading vehicles (there is a mini or ultra light version that can accommodate side-loading). The gentle angle and wide steps can help to eliminate hesitation or fear in your dog. It can accommodate dogs up to 250 pounds. Buy your Light Platform dog ramp here. When you get done with another long day, you probably really look forward to plopping down on the couch for some R&R. And your dog loves nothing better than to join you, which she can easily and safely continue to do with the help of these great couch-friendly dog ramps! This simple, lightweight, portable and attractive step dog ramp makes getting up and down from a favorite couch or chair so easy and safe. You can choose between a three-step and a four-step model. There are three color options: brown/tan, gray and camo/tan. Despite its delicate and stylish appearance, this dog ramp can accommodate pooches up to 200 pounds! Best of all, the cover is machine-wash friendly. Buy your Home Décor Pet Steps here. Pet Gear has another hit on their hands with this secure and stable three-step ramp. You can pick from two options: one for dogs up to 50 pounds and one for dogs up to 150 pounds. There are four color choices: chocolate, tan, cocoa and sage. This pet ramp has rubber bottom grips for stability and extra-wide steps. It is easy to assemble with no tools and the carpet can be removed for cleaning. Buy your Easy Step Pet Stairs here. This dog stair ramp has side safety rails to keep your dog feeling secure as she climbs up and down. As a lightweight ramp option, at five pounds this one is a winner, especially since it will support dogs up to 120 pounds. The ramp is freestanding with the help of a back stabilizer bar, which can be folded down for storage. Buy your Plus Pet Stairs here. 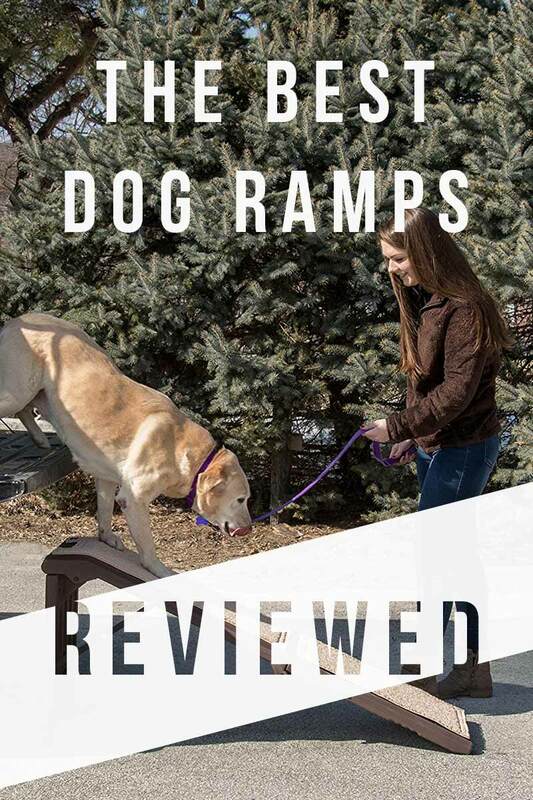 These portable dog ramps are great to take from room to room, from indoors to outdoors, from the house to the car and even out on the road! This truly unique portable dog ramp car comes upholstered with Poly-grass so your dog feels confident walking up and down. The ramp extends to a full 72 inches with an extra-wide walking path and a 250-pound weight capacity. There are locks to use when the ramp is fully open so it won’t collapse unexpectedly. The ramp folds up for storage or travel with a carry handle for convenient storage. Buy your Natural Step Ramp for Pets here. This neat stair ramp for dogs comes in six colors: red, navy blue, gray, black, teal and yellow. It is cushioned to provide extra support if your dog suffers from arthritis or joint pain. It is made of foam with a removable, machine-washable cover. These pet stairs are best used for small compact dog breeds (40 pounds and under according to dog owners). Buy your Portable Pet Stairs here. These great dog ramps are both highly rated and lightweight – the best of all worlds. This lightweight, portable, folding dog ramp for car use is a great solution for dogs up to 150 pounds. The ramp comes in four colors: black/blue, gray, sage and tan/carpeted. Whereas some full-size dog ramps weigh up to 20 pounds, this one weighs in at just over 15 pounds, making it easier to carry. Buy your Bi-Fold Half Ramp here. This dog ramp features a seamless continuous ramp in regular or junior size. It includes protective floor padding that ensures a non-slip surface. There are built-in handles for easy carrying. The regular size can extend to 70 inches if needed. It weighs less than 10 pounds, which makes it a perfect lightweight car dog ramp or bed ramp for dogs. Buy your Smart Dog Ramp here. This lightweight and compact ramp and step system comes in two sizes: regular and extra wide. It can support pets up to 175 pounds and offers a gentle, sloped design to assist senior dogs or dogs recovering from injuries. You can choose from two colors: tan or chocolate. Buy your Combination Dog Ramp here. Large pups have special needs in many areas of life, and typically that also includes choosing a dog ramp that can accommodate wide hips, big paws and a long gait. We hope you enjoy these large dog ramps! This is a particularly tall, sturdy and wide ramp for dogs to get on bed. It can support dogs up to 200 pounds easily. The ramp features rich walnut stained wood. It has four stairs and comes in large and X-large. The ramp is freestanding when set up and it folds down for easy storage. Buy your Wood Stairs Pet Steps here. This secure and stable large dog ramp comes in three sizes: up to 200 pounds, up to 300 pounds, and up to 350 pounds. The ramp is covered in slip-resistant carpeting material. There are two designs: a straight ramp and a two-step ramp. The outside edges are raised for safety and the bottom is equipped with rubberized grips. The full length is 60 inches. Buy your Free Standing Pet Ramp here. We hope you have enjoyed reviewing our list of popular, highly rated dog ramps! If you decide to snap up one of the dog ramps we’ve listed here for your pup to use, we would love to know which one you chose and why! Of course, there are times when you might discover your dog’s needs are not perfectly served by any commercial dog ramp. In this case, you may be interested in learning how to build a dog ramp. If this describes your situation, we encourage you to check out the many great online “how to” videos. And if you find a DIY dog ramp that really meets your needs, please let us know so everyone can benefit! Crowell-Davis, S.L., DVM, PHD, DACVB, “Understanding Behavior: Cognitive Dysfunction in Senior Pets,” Life Stages Management Compendium, 2008. Bittel, Tierarzt, E., Holistic Veterinarian, “Quality of Life – Quality of Death,” 1st International Symposium on Veterinary Hospice Care Proceedings, 2008. Asher, L., et al, “A standardized behavior test for potential guide dog puppies: Methods and association with subsequent success in guide dog training,” Journal of Veterinary Behavior: Clinical Applications and Research, 2013. Bocco, D., “5 Unexpected Ways Mobility Issues Affect Your Dog,” PetMD, 2017. Next articleLabrador Retriever Life Span – How Long Do Labs Live? I have a pensioner friend who has one old dog unable to get into her SUV (Nissan Xtrail) without steps/ramp. Does no-one make a ramp that sits in the back of the vehicle & can be pulled out from a fixed position or better still electric ramp as she find ramps too heavy to lift in and out ?? Lightweight ramps are no good, surely some bright spark has invented an auto ramp?